Adelaide, the capital city of the state of South Australia, will host a combined ATP/WTA event in 2020. Adelaide will host some of the world’s best tennis stars in 2020 with a new week-long ATP and WTA combined tennis tournament set to take place Drive. · Improved access between the centre and outside courts during tournaments. “We are thrilled to welcome the return of international tennis to Memorial Drive, which will showcase Adelaide and South Australia to a global television audience from more than 200 countries,’’ Premier Steven Marshall said. “This significant investment will attract more interstate and overseas visitors to South Australia to support our growing $6.9 billion visitor economy and create jobs, enhancing our reputation as a world-class destination for tourism and sporting events. “My government is committed to investing in infrastructure projects that stimulate the economy, grow local jobs and leave a positive legacy for future generations. “I look forward to welcoming world tennis stars, and interstate and international visitors to Adelaide, when the event kicks-off next year,” he continued. Minister for Sport, Recreation and Racing, Corey Wingard, said the new roof would give Memorial Drive an increased capacity to host small to medium concerts and a ‘live-site’ during major events at Adelaide Oval, such as AFL games. 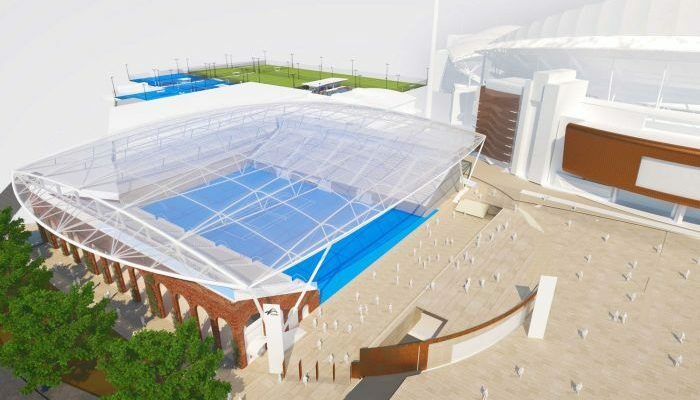 “The roof will also allow for the year-round training of the state’s tennis talent and for use by community groups who are able to access Memorial Drive,” Minister Wingard said. “Thousands of budding tennis players will now get the chance to see their heroes play live in their home state. The flow-on benefits from such a tournament to the state’s sporting communities is immense,” he continued. “We’ve worked closely with the SA Government, via the South Australian Tourism Commission, to ensure world-class men’s and women’s tennis content will be played in Adelaide from 2020,” he continued. The week-long tournament, which is subject to ATP and WTA approval, is expected to attract more than 120 of the world’s top singles and doubles players and offer a minimum of $2 million in total prize money. This entry was posted in ATP Tour, ATP Tour News, WTA Tour News and tagged Adelaide, ATP Tour, Memorial Drive, WTA.